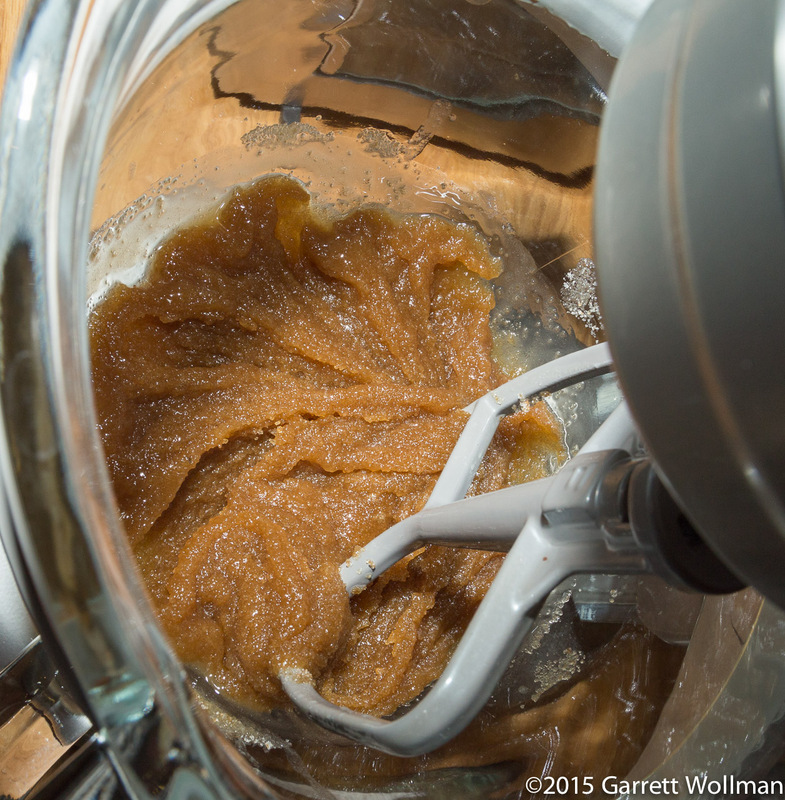 Usually when I do one of these recipe posts, I try to follow the original procedure as closely as possible — especially for bakery. But in this case — from Diane St. Clair’s The Animal Farm Buttermilk Cookbook (p. 188) — the procedure as written bugged me so much that I actually ignored it and created my own, keeping St. Clair’s basic formula and overall method of construction. I’m going to be rather more detailed about this recipe than I usually am for “Other people’s recipes”, so you can try it my way and compare. Notes on the ingredients: St. Clair would of course prefer proper buttermilk, such as her farm produces, but that’s not widely available. I used cultured nonfat “buttermilk” from Butterworks Farm, which doesn’t really add much (other than water and some lactic acid) to this recipe; real buttermilk would have globules of fat in it that might have some effect on the final product. For light brown sugar you can use light muscovado if that’s what you have. 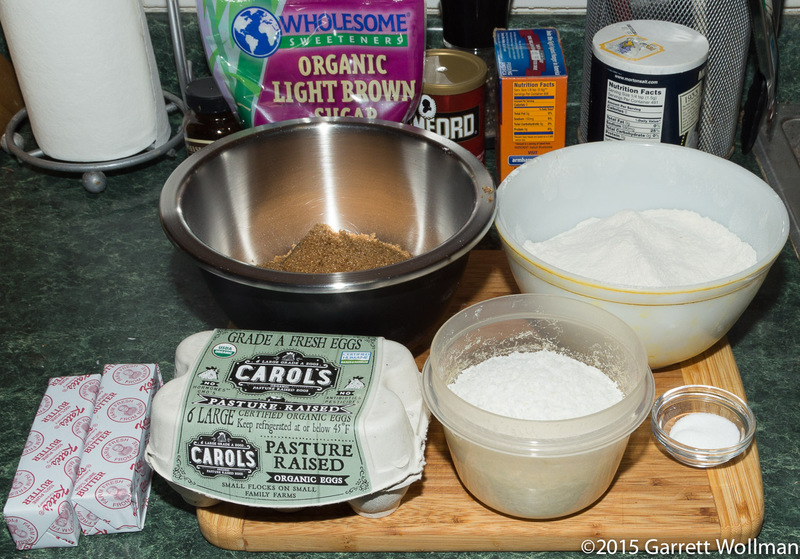 Here is the usual mise en place, although the buttermilk is not shown here. Blondies — like their chocolate cousins, brownies — are bar cookies, baked from a batter in a standard high-sided baking pan. This recipe is designed for a standard 13″×9″×2″ American baking pan (I like the “gold touch” line from Williams-Sonoma); in millimeters that would be 228×330×50 but the area is more important than the absolute dimensions. (You could probably use any straight-sided pan with an area of about 755 cm²; a round 300 mm (12″) cake pan would be rather non-traditional but has the right area.) 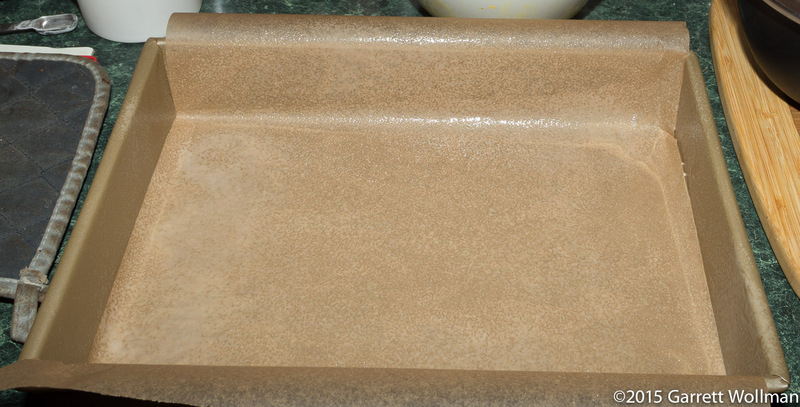 I’ve prepared the pan by applying baking spray, then pressing a parchment “sling” into the pan and applying more spray on the exposed parchment surface. The “sling” makes it easy to extract the finished bar from the pan after cooling, to ensure that it doesn’t break apart or leave bits stuck to the bottom of the pan. The oven is preheated to 350°F (175°C). In a medium bowl, whisk together the three eggs, buttermilk, and vanilla, and set aside. 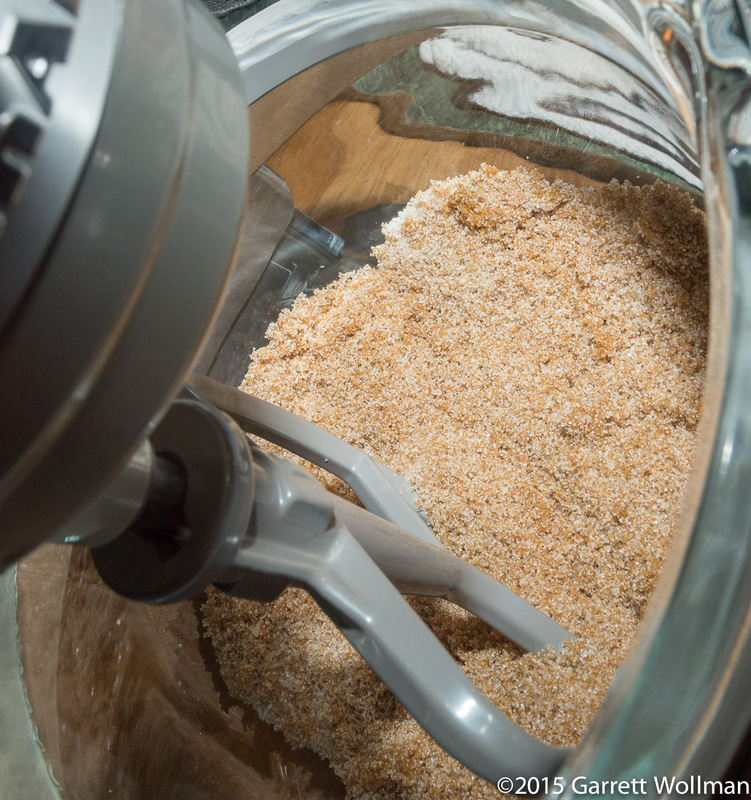 In another bowl, sift together the flour, baking soda, baking powder, and salt, and set that aside as well. Stir the cooled melted butter into the combined sugars. 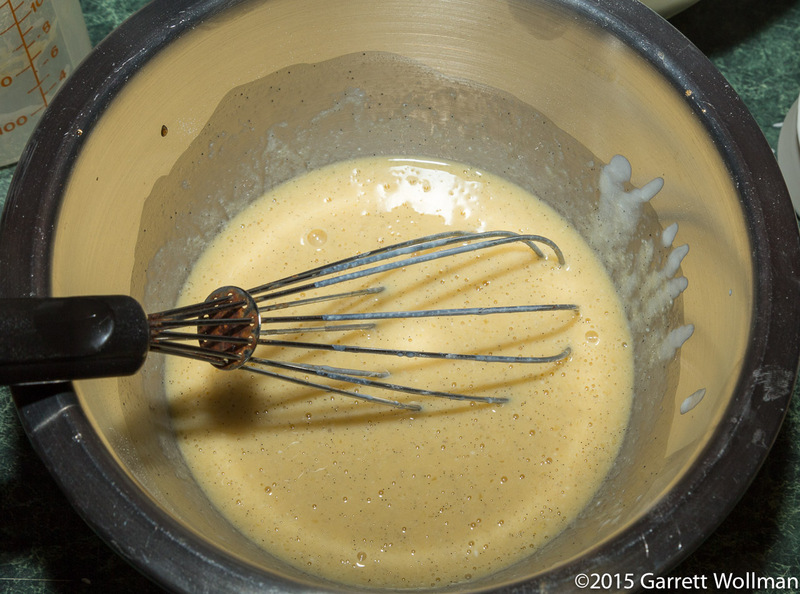 Then mix in the egg-buttermilk-vanilla mixture, scraping down the sides of the mixing bowl as needed. 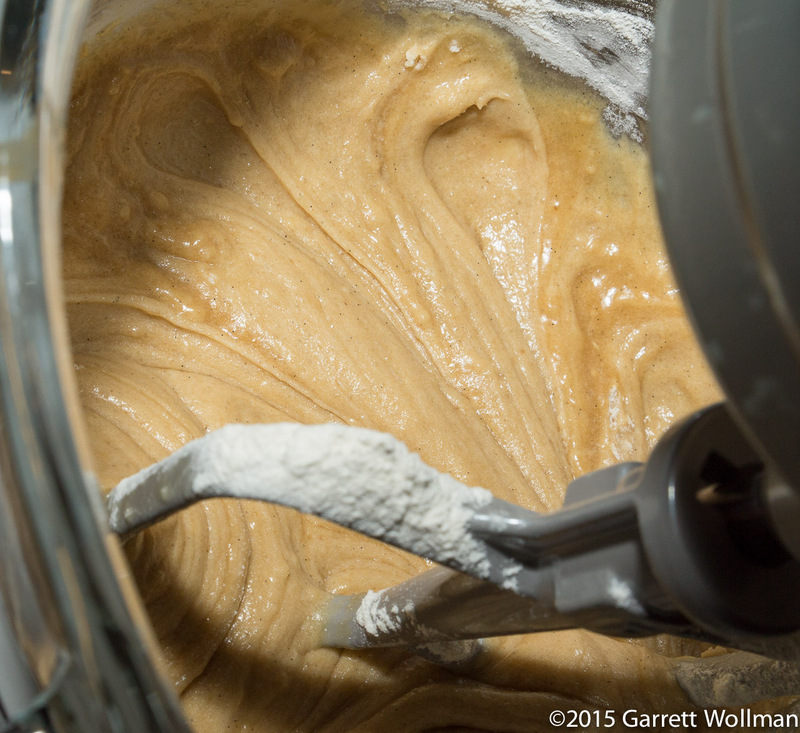 Add the flour mixture gradually and mix until fully incorporated. Mix in the coconut. 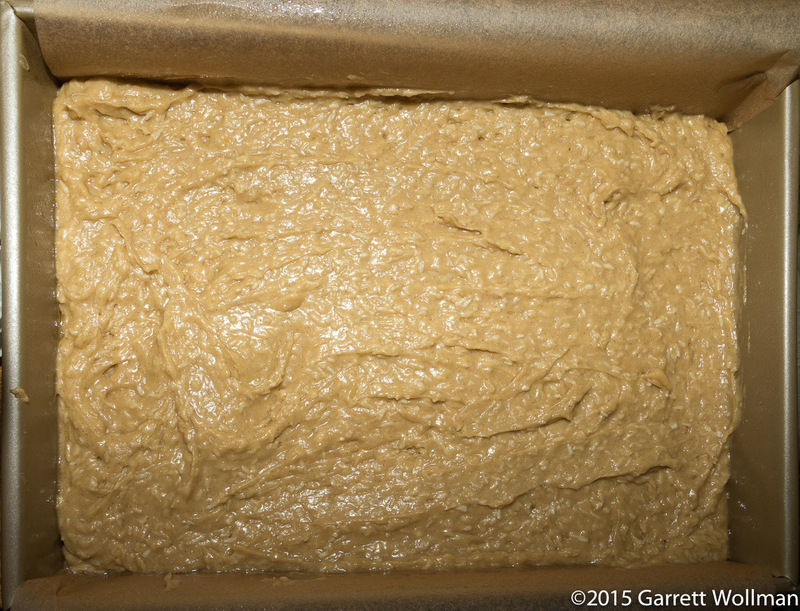 The batter is now finished and ready to bake. Pour the batter into the pan, and use a spatula to spread it in an even layer. Bake in the preheated oven for about 30 minutes — St. Clair says until “a tester inserted in the center emerges with a few crumbs clinging”. 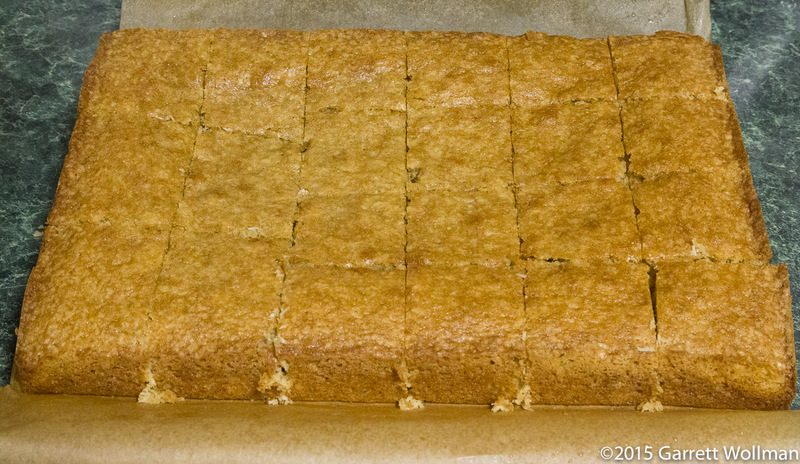 I’m cheap and use a knife rather than a cake tester, which caused the center of the bar to deflate a bit prematurely. For me the baking took about 32 minutes. 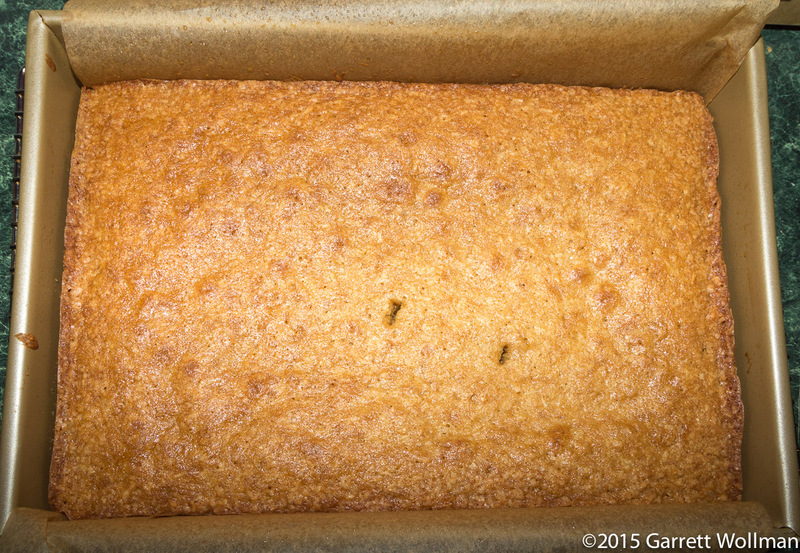 Let the bar cool in the baking pan for 1½–2 hours before portioning. And here’s what a single portion looks like, as I had it for dessert last night. Overall my impressions are a bit mixed: it is moist, and definitely flavorful, but I didn’t really catch any buttermilk flavor, and I thought that it could have used significantly more textural contrast — if I were making this again, I would add substantial quantities of nuts (walnuts or pecans by preference) and chocolate chips, and might use a different texture of coconut (chips? bigger shreds?) to give it more chew. 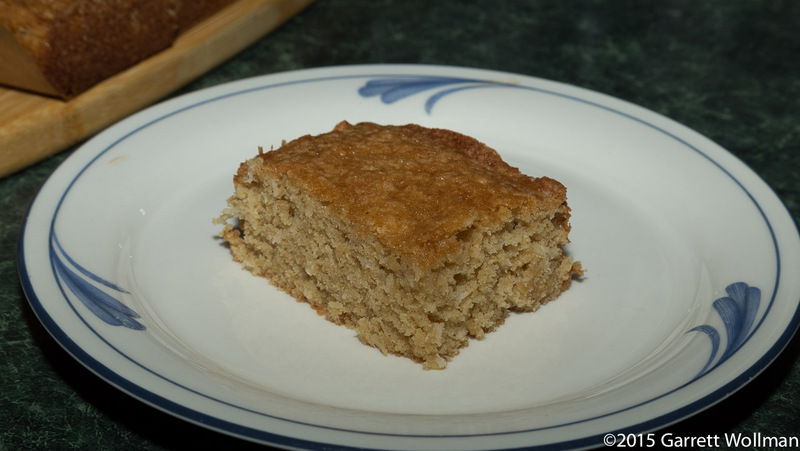 It might also be worth making with a whole-wheat flour to give it a bit more color and hearty flavor. Of course, if I did add nuts and chocolate chips to this recipe, it would make a huge change (for the worse) to the nutrition. However, it would increase the volume of the batter to the extent that it probably wouldn’t fit into a 9×13 pan any more, either, so the yield would go up. Further experimentation is clearly warranted. 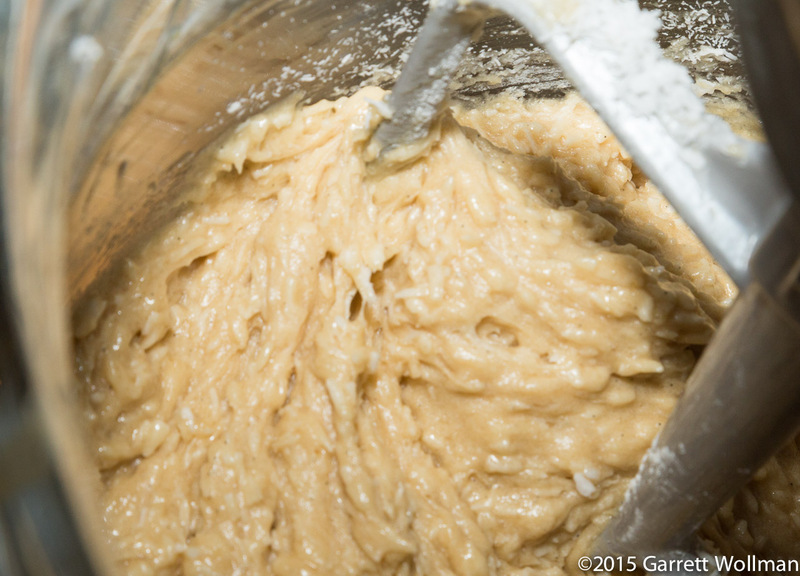 Gallery | This entry was posted in Food and tagged blondies, buttermilk, cookies, Diane St. Clair, recipe. Bookmark the permalink.